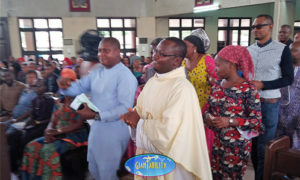 Assistant Parish Priest of St. Agnes Catholic Church, Maryland, Lagos State, Rev. Fr. Emmanuel Emiri, has called on Christians to uphold the promises made to God during baptism. The cleric made the call on Sunday on the occasion of the Catholic feast to mark the Baptism of Jesus Christ. Delivering a homily at one of the Masses celebrated at the church, Rev. Fr. Emiri emphasized the need for Christians to realize the significance of being baptized with water, a sacrament which he said brings new life to a Christian and which registers them as sons and daughters of God. Emiri urged Christian faithful to look upon the act of humility in the baptism of Christ when He allowed the least in heaven to baptize the greatest in heaven, encouraging them to ascribe themselves to the nature of the savior of the world in order to learn the act of living a holy and humble life. He said that the dramatic manifestation of Jesus through the Father, the Son and the Holy Spirit at baptism teaches Christians “how and who Jesus is”. “It also reminds us of how important the vows and promises we made on the day of our baptism. Some of us will say to ourselves, that I was not the one that said those vows, my parents and God parents said them but it is also the same thing, the church has made it such that every Easter vigil, we all are made to profess our faith, to renew our vows made during baptism,” the cleric noted, adding that for that singular reason, true believers must strive to maintain their vows to believe in the one true God always. This entry was posted in Belief, Christianity, Faith, News and tagged Baptism, Catholic, Jesus Christ, Sunday Mass. Bookmark the permalink.